"Jamia Masjid (Urdu: Ø¬Ø§Ù�Ø¹ Ù�Ø³Ø¬Ø¯ Ø³Ø±Û�Ù�Ú¯Ø±â��) is a mosque in Srinagar, Jammu & Kashmir, India. The Jamia Masjid of Srinagar is situated at Nowhatta in the middle of the Old City. It was built by sultan Sikandar Shah Kashmiri Shahmiri in 1394 AD." Under the order of Mir Mohmmad Hamadani, son of said-ul-Auliya Mir Sayyid Ali Hamadani.Sultan Sikhandar's son Zain-ul-abidin extended the Jama Masjid by including turret. 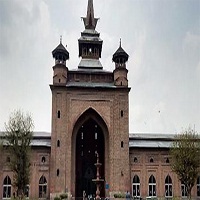 It has similarities to Buddhist pagodas and is constructed in Persian style.Jamia Masjid is located in a historical area which also was central zone to the religio-political life in Srinagar.On the western side, the mosque is 381 feet (116 m) in length while on northern and southern sides it is 384 feet (117 m) long. The inner courtyard measures 375 feet (114 m) x 370 feet (110 m) having a 33 feet (10 m) x 34 feet (10 m) water tank with a fountain playing in the center. Thus the space area of the mosque is 140,000 square feet (13,000 m2). Its walls made of burnt bricks are over 4 feet (1.2 m) thick.